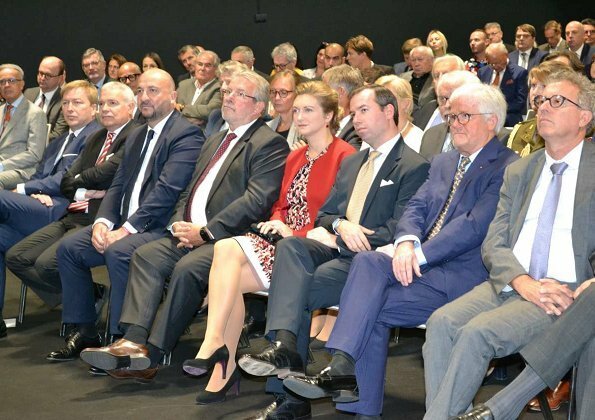 On October 14, 2018, there was a general election in Luxembourg and Luxembourgish citizens voted for 60 chairs of the Parliament. 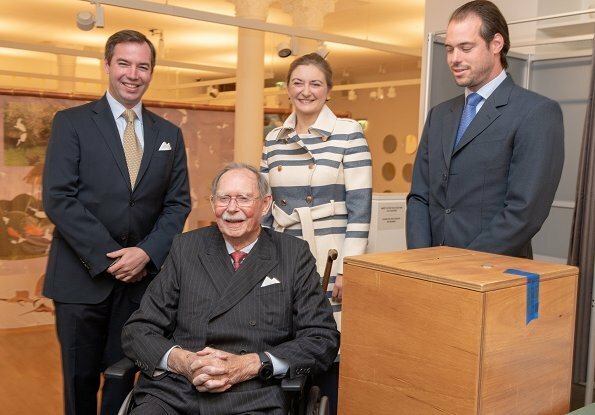 Hereditary Grand Duke Guillaume and Hereditary Grand Duchess Stephanie of Luxembourg have been in London for a while and they returned to their home at the weekend due to the elections. 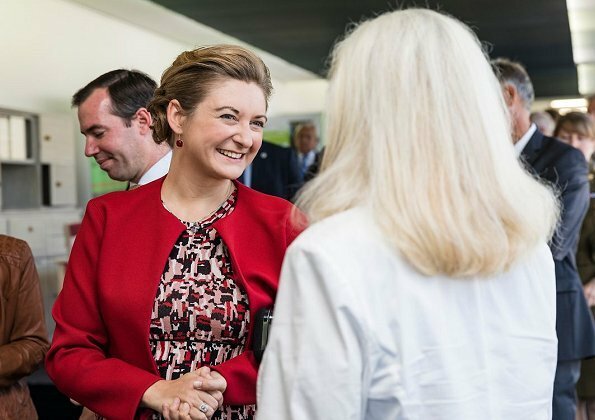 On October 13, the Couple firstly attended Home and Living Expo 2018 in Kirchberg which took place in collaboration with National Housing Week. In the evening, the Couple attended Night of the Museums event. 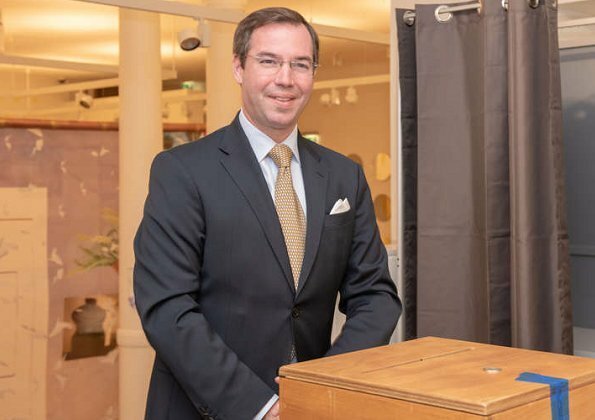 The Hereditary Grand Couple voted in the General Elections on Sunday together with Grand Duke Jean and Prince Felix. 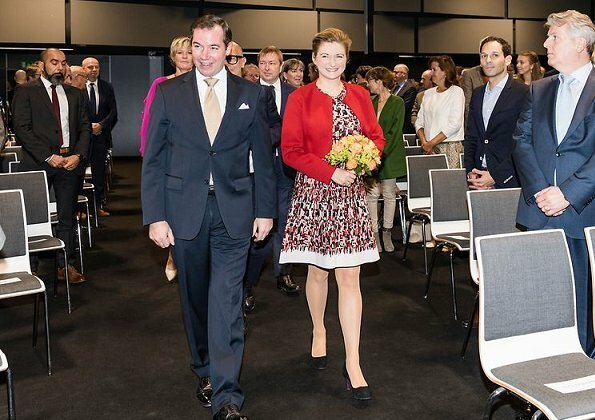 On October 13, Hereditary Grand Duke Guillaume and Hereditary Grand Duchess Stephanie of Luxembourg attended "Home & Living Expo 2018" in Kirchberg which took place in collaboration with National Housing Week. 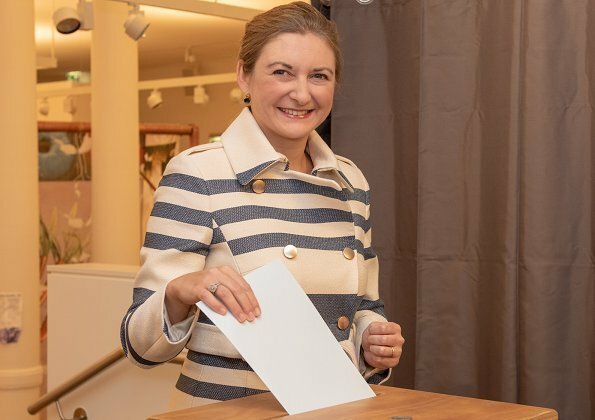 Het zal wel een lief en vriendelijk prinsesje zijn, maar ze heeft toch dringend hulp nodig qua styling, haar schoonmoeder is altijd knap . Lovely couple!!! They both look so kind and genuine! Stephanie looks nice, especially with red bolero when she had also nice up-doe. But also the gray ensample is nice. This is trendy and suits her very well. She dresses better since they moved to London. Stephanie looks lovely and very, very happy. Lovely to see. Stephanie's recent hair up-do style is a welcome change as is Guillaume's removal of that grungy beard style that so many men think is attractive. They both look more in tune with their station in life and he especially looks more youthful. I mostly like both of her outfits in this set of photos. 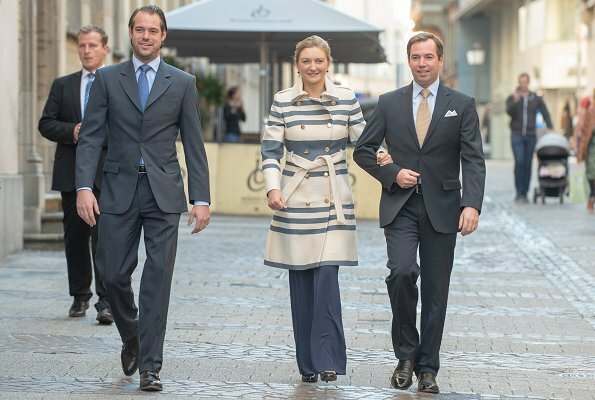 The blue and white coat is a good look but the pants have that wide bottom which just doesn't flatter her. I like the red/black dress except for the white band at the bottom (summer is over) and the length. Solid red or black there would not draw your eye so much, plus a couple more inches would balance and be more modest when sitting. Nice coat today. 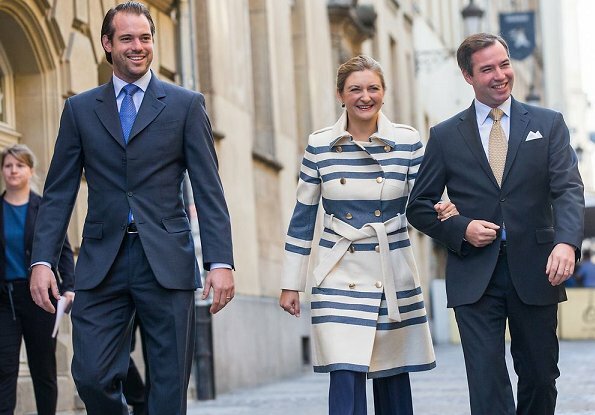 She seems very happy, love her coat looks really nice.Guillaume looks like he is 17 without the beard. Hope he grow's his beard again he looks so much better with it.Nice to see GD Jean and Felix too. I love the first outfit the best. She looks so good in her wide legged pants, and the coat is a great match. I am not as big a fan of her second look. The dress is a little short, and I am not a big fan of the jacket. The stockings have a pale tone. If she is going to wear them, we shouldn't see them. 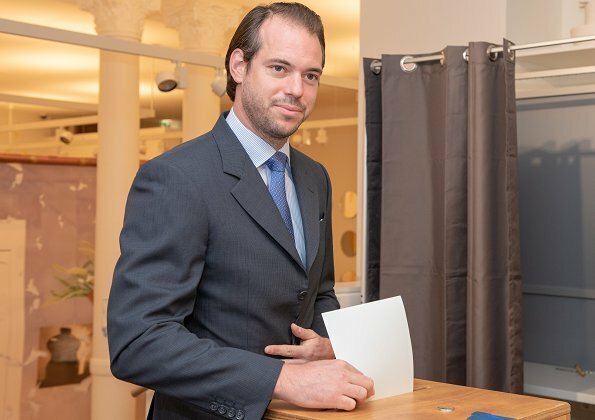 I really get used to Guillaume's beardless face now, in this pics he really looks good without. 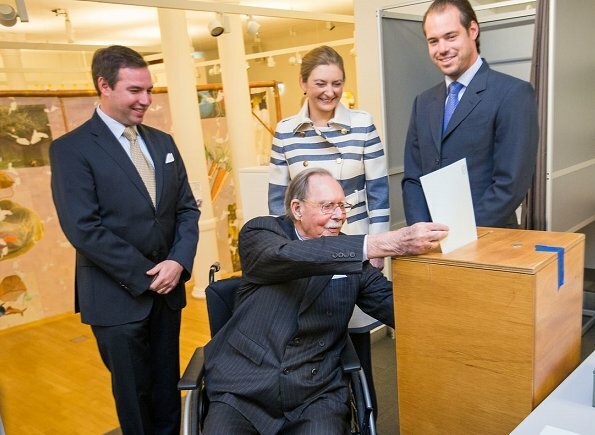 Stephanie looks very beautiful, especially in that pics with that wonderful dress and nice jacket. Both look very happy and relaxed in the pics, London seems to be good for them. She is a bright star in the whole auditorium of men!